Mr Charles McGrory of Glasgow Scotland recently contacted me to comment on the site and offered up some projects he has done on his boat. He has an Ohlson 38 he has restored and this was one of his projects to brighten up his mast by painting it. Over the next week or so I will try and put up a nice project he has for a watch standing seat in the companionway. 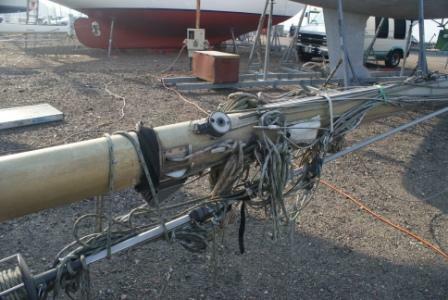 new mast of thinner section would be approx £5000 without the tangs etc. Smooth spray can. My mast was ghastly as you can see. whole mast which was down for the boat going into the paint shed. What a difference! I want to thank Mr. Charles McGrory for submitting his write up of this project. 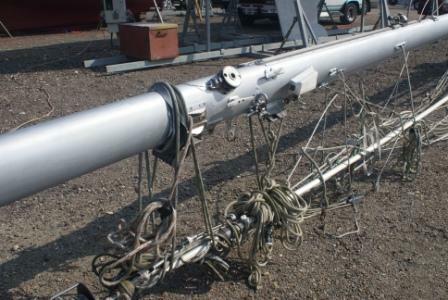 It is a nice product and idea for an inexpensive but durable update to an old mast to make it look better and give it some additional protection. You can find Hammerite Paint here. We used Sherwin Williams auto paint on our mast. Brushed it on and it came out great and was easy to do. We had pulled Isabella to have electronics installed. The guys at Deatons in Oriental were amazed at how nice our mast turned out. Most two part auto paints are the same as perfection or other two part boat paints… They are very tough and significantly cheaper.